Few travelers name Lviv as a bucket-list destination, but we think it’s an Eastern European city not-to-be missed! The charming – and quirky – city of Lviv, Ukraine features a well-preserved Old Town, an abundance of nature, a slew of odd sights and a fascinating history. From the amazing architecture to the weird attractions, Lviv far exceeded our expectations. 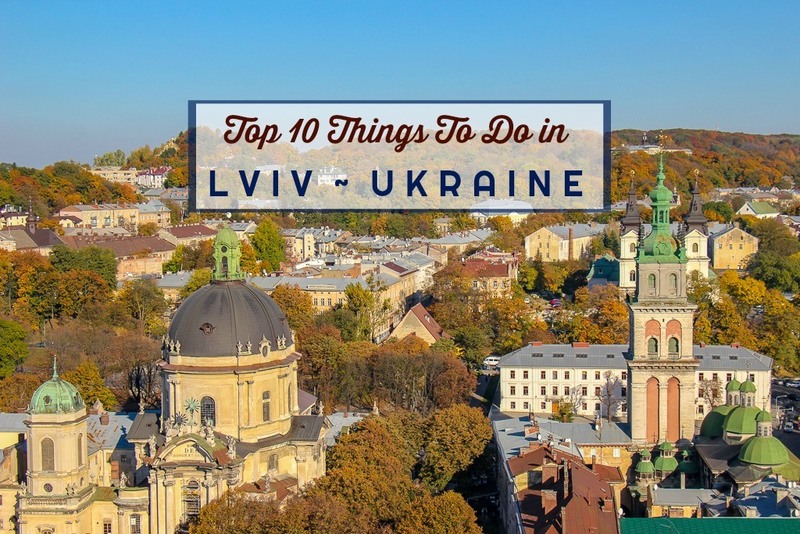 During our stay, we discovered numerous things to do in Lviv, Ukraine and compiled a list of our Top 10 recommendations. Our list of what to see in Lviv includes attractions in – and around – the city center. However, all sights are within walking distance from the Old Town. At the end of our Lviv travel guide post, you will find a Lviv map of our recommended sights. We started our exploration of the city in the Old Town where 13th century buildings have survived fires, wars and modern times. Picturesque Baroque and Renaissance structures line the cobblestone streets – and sit in sharp contrast to the surrounding Soviet-era blocks. The beating heart of the Old Town is Rynok Square, a UNESCO World Heritage Site. Dating to the 13th century, the square is lined with historic houses. 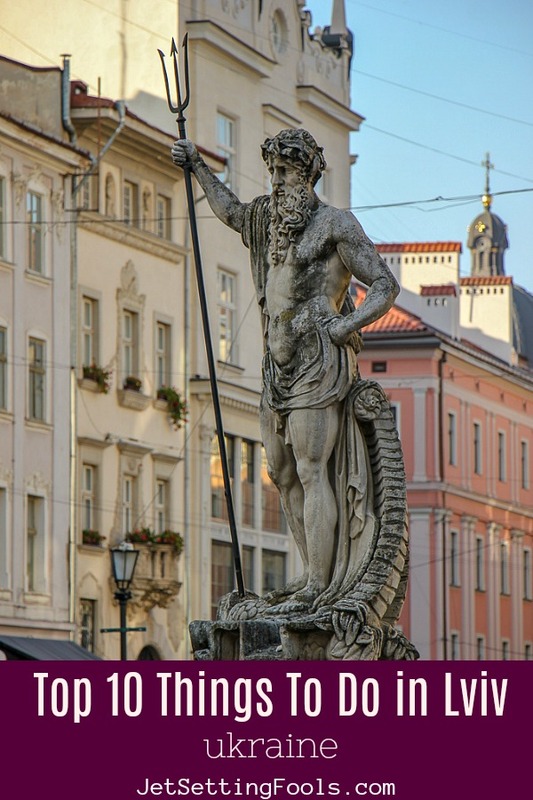 Decorating the four corners of the rectangular Market Square are elaborate fountains of famous gods: Neptune, Diana, Amphitrite and Adonis. Sitting prominently in the center of the square is the Lviv Town Hall and its rising clock bell tower. The bell tower platform offers visitors the opportunity to see the city from a bird’s eye view. Making the climb to the viewpoint is one of the top Lviv things to do (and it’s a good way to get acquainted with the city layout!). As a popular meeting spot, Rynok Square sees a steady stream of people with trams flowing through the historic center – often to the beat of local street musicians. The talented performers – who range in both age and musical style – attract crowds of people that stick around to listen to more than just one song. We followed suit and heard everything from traditional folk music to heavy metal. With feet on the ground, we wandered the cafe-lined lanes while marveling at the historic architecture. Visitors can create their own city tour (like we did) by navigating the cobblestone lanes and expansive squares to the top Lviv sights. However, to better understand the historic sights of the city, join a local Lviv guide who will lead visitors on a walking tour to the top spots in the city – and give local insight. Get more information and book a half-day (5.5 hour) Sightseeing Lviv Tour on Viator. Lviv sightseeing is not limited to historic streets and buildings…it includes nature, too! Lviv is located just 100 miles from the Carpathian Mountains – and the Lviv region is dotted with hills, forests and green space. We discovered two short hikes just north of the city center that lead to incredible viewpoints: High Castle and Lion Hill. Vysokyi Zamok, Lviv High Castle or Castle Hill, is the highest point in the city – rising 1,342 feet above sea level (which is 370 feet above the city). Named for the castle that stood atop the hill from the 13th to 19th centuries, the hill bears very few remnants of the structure. However, we did not go to Castle Hill for remains; we trekked to the top for the views. A path winds around the hill to a viewing platform that offers awesome Lviv 360-degree views. The spacious viewing deck is encircled with benches – and there are men at the top who rent binoculars and sell shots of local liquor. Beautiful any time of day, we especially enjoyed climbing the hill for sunrise and sunset, when the city was draped in soft light. The hill is easily accessed on foot from the city center (but there is a road that takes visitors close to the top for those who would rather skip the inclined walk). Lion Hill (also called Bald Hill) is just east of Castle Hill; the summit is marked by a simple cross. The much more rustic hiking trail sees far fewer visitors, but offers equally stunning vistas. The trailhead can be a little more tasking to find than the one for Castle Hill, but it is easy enough to locate with the help of Google Maps. Although it’s not a particularly difficult trail, proper footwear (not flip flops or high heels) is recommended as portions of the track are steep and sandy. The Lviv Opera – formally named the Solomiya Krushelnytska Lviv State Academic Theatre of Opera and Ballet – sits atop the ‘buried’ Plotva River and was opened in 1900. The opulently decorated grand façade features imposing columns and statues that overlook a spacious plaza, fountain and long promenade park. Not only a tourist attraction, men often gather on the shaded benches to play chess. While absolutely beautiful on the outside, going inside for a performance is the real treat. The lavishly decorated theater hosts a multitude of performances, including matinee and evening shows. With a capacity of 1,100, the Lviv Opera hosts a variety of performances, including ballet, opera, concerts and plays. During our visit, we attended a special concert performance by the U.S. Air Forces in Europe Band – and wanted to return to see an opera, but it sold out! Most performances are very affordable, with tickets for some shows costing as little as 50 UAH ($1.75 USD). At that price, travelers of all budgets can enjoy a show. Lviv has a complicated history that dates to the 13th century. Once the capital of the Kingdom of Galicia, the city was subsequently part of (or ruled by) numerous countries, including Poland, Austria, Germany, the Soviet Union and (since 1991), Ukraine. Each of the controlling empires left marks on the city – some prettier than others. Visitors can learn about the history of Lviv in one of the many city museums. Two Lviv museums we visited – and highly recommend – are the Potocki Palace and the Prison at Lontskoho Street. Potocki Palace, built in the 1880s, was once the city’s grandest residence. Visitors can tour the palace, which has historically decorated rooms on the ground floor and an art gallery on the second floor, as well as the grounds. Next to the Potocki Palace is the Art Palace and the Lviv National Art Gallery. The Prison at Lontskoho Street Museum is the former political prison used by the Polish, Nazi and Soviet regimes. Thousands of anti-government supporters (and those who were simply suspected of being anti-government) were detained at the prison. In the days before the Nazis invaded Lviv in 1941, the Soviets ‘disposed’ of about 1,000 prisoners, shooting them to death on site. The small museum details the history and tragic events that took place at the prison. There are two museums that we didn’t visit – but get rave reviews: the Lviv Folk Architecture Museum and the Lviv Pharmacy Museum. Outside of the city center, the Lviv Folk Architecture Museum is an open air museum that features traditional homes and wooden churches that are typical of Western Ukraine. Many folk traditions and crafts – such as making Ukrainian Easter Eggs – are brought to life at the museum. 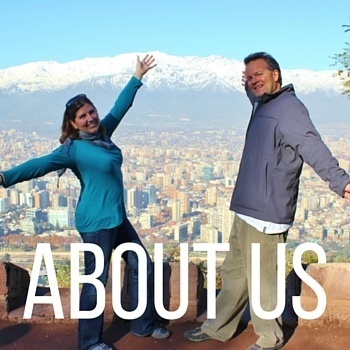 Visitors can go on their own or book private tours on Viator. The Pharmacy Museum, the oldest pharmacy in Lviv, features rooms that recreate the historic pharmacy, complete with a lab and ancient dungeon. There are an astounding number of historic churches in Lviv, Ukraine. In fact, it would be impossible to visit the city and not notice the numerous places of worship. There are seven churches just within the Old Town – including three cathedrals: Lviv Latin Cathedral, Armenian Cathedral and Dominican Cathedral. We were enamored by the ornate architecture and extravagant interiors of the churches we found throughout the city – and popped into any church that had their doors open. As top Lviv places to visit, the Lviv Tourist Information Office provides maps marked with a walking route to several of the city’s most famous churches…but it doesn’t include them all. 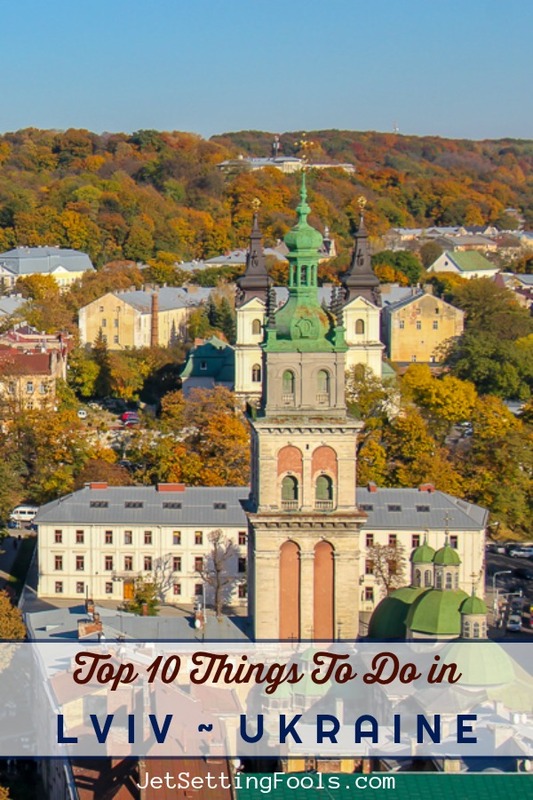 For our list of must-see Lviv churches, see the recommendations below. The St. Nicholas Church is one of the oldest churches in Lviv, dating to the year 1292. The quaint exterior of the Ukrainian Orthodox church differs vastly from the magnificent and glittering interior. Also called the Cathedral Basilica of the Assumption, the Lviv Latin Cathedral was built in the 14th century – and is one of just two churches in the city that stayed open during Soviet rule. A church has stood on the site of the Dominican Cathedral since 1378, with the present church dating to 1749. During Soviet rule, the church was transformed into the Museum of Religion and Atheism. However, after Ukraine gained independence, the church became the Ukrainian Greek Catholic Church. Many Lviv visitors find their way to Orthodox Dormition Church (also called the Assumption Church or Wallachian Church) by looking for the landmark Korniakt Tower, which stands at 65 meters. Our favorite part of the church, however, is the incredibly decorated Chapel of Three Saints (which is accessed via the courtyard). Consecrated as the Church of St. Michael the Archangel in 1991 by the Ukrainian Greek Catholic Church, the church was previously called the Carmelite Church. Inside, light streams through the stained-glass window and frescoes decorate the walls. The Armenian Cathedral began as a small church that was built in 1363. The church, which was extended multiple times – and was even used as storage by the Soviets – is currently being renovated. Just outside the Old Town Hlyniany Gate is the Bernadine Church, which dates to the 17th century. In the 1730s, the church acquired its extravagant Baroque interior. Completed in 1760, St. George’s Cathedral sits on a hill to the west of the city center. Grand in its appearance, the pale-yellow exterior of the once-Orthodox-now-Greek-Catholic church is beautiful from afar and up-close. Local food and drink are some of the best things to experience in any destination. We are particularly fond of Ukrainian cuisine and craft beer – and feasted while we were visiting the city. Similar to many traditional Slavic dishes, the food in Lviv has been influenced by neighboring cultures. The hearty dishes, which likely contain a rich meat and earthy ingredients, are comfort food at its best. Also read our detailed post on the top recommended Lviv restaurants, which features the best places to eat in the city. Also looking for ideas of things to do in Lviv at night, read our tips for Lviv nightlife and the best craft beer bars in the city. West of the city center near the university, is the spacious Ivan Franko Park – the oldest park in the country and one of the oldest city parks in Europe. Developed more than 300 years ago, the park features wide crisscrossing paths, a gazebo and a variety of trees. Throughout the park, there are places to relax and enjoy the scenery. A massive statue of Ivan Franko, the famous Ukrainian writer, stands at the north end of the park. Just southeast of Ivan Franko Park is another park, one that is less sophisticated than the neatly planned Ivan Franko Park – and is shrouded in a mysterious and dark past. The wooded area has a few trails that lead to a nearly-hidden circular brick building, which is part of the Lviv Citadel grounds. The complex, which includes the newly remodeled 5-Star Citadel Inn hotel that sits on a hill nearby, was built in the 19th century as military fortifications. The Lviv Citadel wasn’t used, however, until World War II when it was transformed into a prison by the Nazis. More than 100,000 people were killed at the complex, earning it the nickname Tower of Death. The posh Citadel Inn, which provides no trace of the horrific past, is open to visitors (check out the viewpoint). Those interested in the abandoned (and inaccessible) structure that is surrounded by a moat and barbed wire, need to find the trail that leads into the woods. An unusual tourist site, the Lychakiv Cemetery in Lviv is one of the city’s top attractions. Established in 1787, the cemetery has more than 400,000 burial plots and is the final resting place of many of the city’s elite residents. Notable inhabitants include politicians, intellectuals and poets (yes, Ivan Franko is buried at Lychakiv). Many of the graves are adorned with sculptures, making the 100-acre cemetery seem like an open-air museum as much as a burial ground. Paths weave through the forested cemetery past majestic mausoleums and quaint chapels. Tombstones – some more elaborate than others – are engraved in multiple languages, including Ukrainian, Polish, Russian and English. Many sections of the cemetery are dedicated to deceased military members – such as the Ukrainian National Army Memorial, the Field of Mars and Defenders Cemetery. Among the numerous memorials at the cemetery, there is even one dedicated to Americans who defended Poland (1919-1920). As a tourist destination, parts of the cemetery are crowded, but with such an expansive graveyard, it is possible to find places of solitude. Visitors have the option of joining a tour and/or purchasing a map. We did neither, but feel we would have benefited from the additional information. Top Tip: The cemetery is not that far from the Old Town and is easy to walk. However, visitors who want to experience riding one of the classic Lviv trams should hop aboard and ride one from the Old Town to the cemetery. The Lychakiv Cemetery isn’t the only odd attraction in Lviv; in fact, it is just one of the many. The city is filled with obscure statues, intriguing street scenes and peculiar collections. Want to solve a humongous crossword puzzle or stroll down a lane with eight names? You can do it in Lviv. Looking for toilet paper with Putin’s face on it or maybe a Mexican lager beer named after President Trump? You can find them both in the Lviv city center. Seeking out these off-beat oddities is just one of the fun things to do in Lviv. A few of the strange sculptures found in the city, which are often displayed in seldom-visited courtyards, are a beer belly statue, a traveler’s backpack, a keg-carrying monk and a seated Statue of Liberty. However, the most outlandish of them all is the statue of Leopold von Sacher-Masoch – the writer responsible for the term masochism. Although it appears to be an ordinary statue, reach into his pocket to understand why it is so bizarre. Arkhivna Street – as it is formally known – bears eight street names (that’s not confusing at all!). Each year, the street is renamed to honor a famous filmmaker during the KinoLev Independent Film Festival; new signs are added to the street without removing the old ones. Just outside of the old town, a 100-foot-high crossword puzzle is painted on the side of a towering apartment complex; those who want to solve the puzzle can find clues throughout the town. In addition to the ground-level streets, a maze of underground passageways are carved out beneath the city. The Lviv underground labyrinths can be seen with a guide on a two-hour journey (find out more about this tour on Viator). However, in our opinion, the most unusual attraction (and we use that term lightly) is the Yard of Lost Toys. Dedicated to ‘toys that have been left behind’, the makeshift museum is free to visit – and guests are welcome to contribute a toy of their own. The weird collection of worn stuffed animals and dilapidated toys clutter an otherwise normal apartment complex yard (and we can’t help but wonder if all the residents are appreciative of the mess and the camera-toting tourists). The place left us feeling slightly unsettled…and fearful that Chucky from Child’s Play was about to jump out from the bushes. During our stay in the city, we found our way to a few of the city’s best markets. The local shopping experiences are truly a feast for the senses. The stalls at Dobrobut Market and Krakivsky Market are filled with local fashions, in-season produce and raw meat. Simply wandering through the markets allowed us a glimpse into local life in the city. The Used Book Market is another must-see in Lviv. Aptly set at the base of the Ivan Fedorov Monument (a famous printer), vendors peddle their wares – including everything from used books to vinyl records to antiques. Although relatively small, the flea market is well-worth a walk-through. We enjoyed perusing through the stacks of records, sifting through old military paraphernalia and flipping through books. The vendors are not pushy – so visitors can take their time and shop around. Although we prefer markets to malls, there are modern shopping outlets in the city. The Lviv Forum Mall, which is within walking distance from the Old Town, has numerous fashion retailers, as well as a large grocery store, electronic stores and a movie theater. Use this Lviv, Ukraine map to pinpoint the sights listed above. Use this link to Google Maps for an online sightseeing Map of Lviv, Ukraine. The Lviv Information Center is located in the Town Hall in Rynok Square. Visitors can find helpful information and maps at the center. Our trip to Lviv was in the autumn, which is a beautiful time to visit the city. Most days were warm and sunny – and leaves were changing colors on the trees. As we had such lovely weather, many of our recommended things to do in Lviv are outdoors. However, if your trip coincides with foul weather, you may be wondering what to do in Lviv when it rains. There are many fun things to do in Lviv indoors – some of which are features in our list. Check out the city museums, churches and restaurants if you unfortunately encounter bad weather! Check Lviv weather for your trip on weather.com. During our visit, we stayed in an Airbnb apartment very close to the Old Town (check it out here!). We have found that staying in apartments is often less expensive than hotels – with the added benefits of more space and a full kitchen. We definitely recommend the apartment we rented as a place to stay in Lviv, but you can search for apartments in Lviv, Ukraine on Airbnb (sign up with this link and save money on your first stay!). Guests who would rather stay in a Lviv hotel have many options. For a luxurious stay, the Lviv Grand Hotel and Spa gets rave reviews. The property is located in the historic Old Town – and while it has all the modern conveniences, it retains classic charm. Additionally, a buffet breakfast is included in the price of the room. Get the details and book your stay at the Grand Hotel Lviv, Ukraine. Other top-rated hotels in Lviv, Ukraine are The Astoria Hotel and Hotel Atlas Deluxe. Looking for something else? 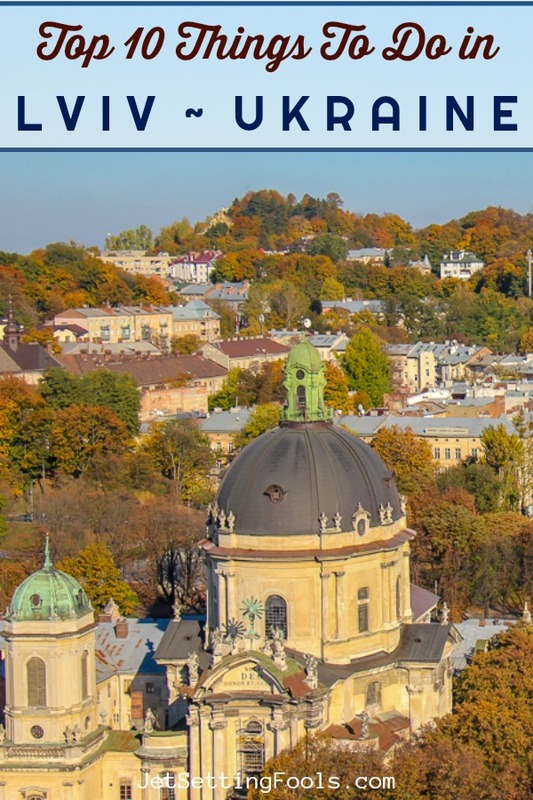 Start your Lviv, Ukraine hotels search on Booking.com – it’s where we start when we are searching for hotel accommodations! 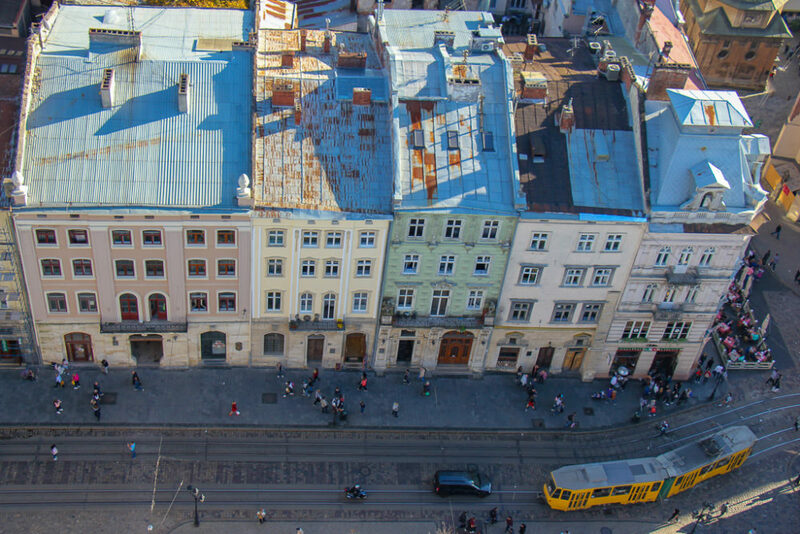 Top Tip: You can also use Booking.com to find an affordable hostel in Lviv, Ukraine, too! Start your search now! Flights to Lviv, Ukraine land at the Lviv Danylo Halytskyi International Airport. The Lviv, Ukraine Airport is serviced by multiple airlines, including several low-cost carriers. Search for best fares on airplane tickets to Lviv, Ukraine on SkyScanner. Visitors arriving via plane can book airport transfers on Viator in advance of arrival. The Lviv-Holovnyi Railway Station is the main passenger and freight train station in the city. The station receives both international and domestic trains to popular destinations, such as Warsaw, Krakow and Kyiv. From the train station, visitors can get to the city center via tram, bus or taxi. We Want To Know: What would you add to our list of what to do in Lviv, Ukraine? 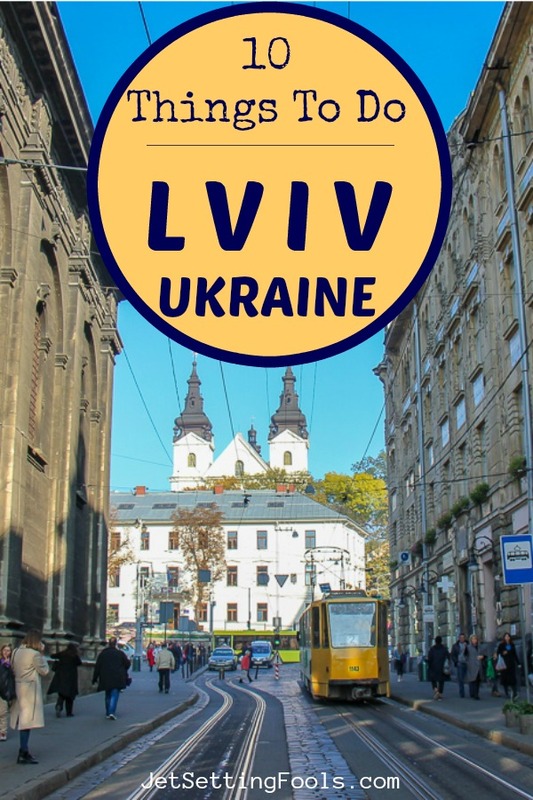 Are there top things to do in Lviv that we left off our list? Give us your best tips and advice in the comments below! Start planning your trip to Ukraine! 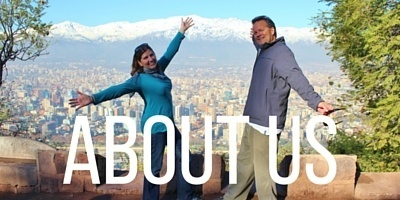 Search for the lowest airfares, the best accommodations and fun things to do…then start packing! 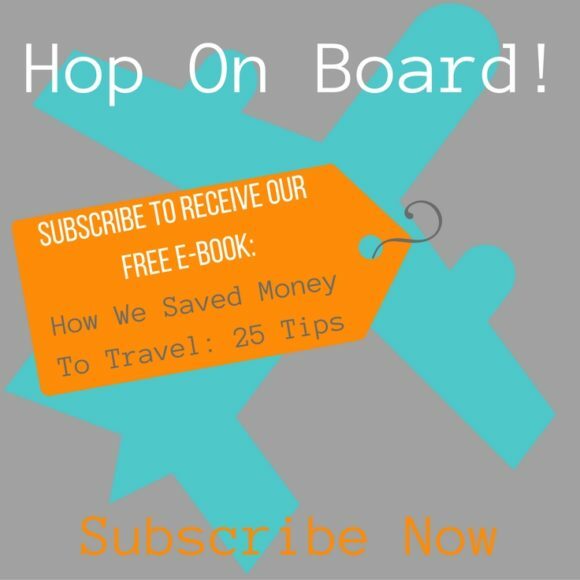 Want more travel planning tips? Head over to our Travel Planning page for more information and tips on traveling – and for country-specific information, take a look at our Travel Guides page! I love visiting places off the beaten path! This sounds like a treasure. When we went to Europe we planned on spending time in London and Paris, but due to unique circumstances found ourselves in Annecy instead! It was pure, and untainted and we felt like we really experienced the true culture! That’s what this post reminded me of and now I want to go to Lviv! That’s why we travel, right?! Cheers Catherine! Thank you so much! We’re glad you enjoyed the post.